Grows up to a metre in height with clusters of small creamy white flowers which bloom June - October. The leaves give off a lemon odour when crushed or bruised though this is lost if cooked. It can become invasive in gardens. Good for attracting bees. 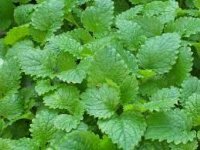 This plant makes a good tea to relieve tensions, anxiety and irritability and promotes sleep. As a salve it may be used to soften lips and lessen the growth of cold sores. It is thought it may be good for the memory function as it increases the activities of an enzyme linked to this. It also has a healing effect on burns, itching and swelling. 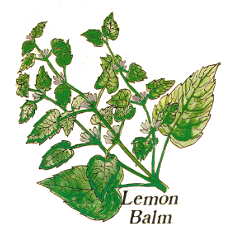 The greeks used the scent of Lemon Balm to smear inside their beehives. They called the herb 'melisphyllan', meaning honey leaf. It was at this time and later in the middle ages that it was believed to be helpful in healing wounds without inflammation. it was the main ingredient in Carmalite water distilled by the Parisian monks from 1611 and is still used today in France as a digestive aid. In medieval times it was planted by the front doors to ward off evil spirits.